The jogger said he was bitten on the face and wrist, according to a statement from Colorado Parks and Wildlife. But he was able to fight back, killing the young mountain lion. The man's injuries were serious, but not life-threatening, and he was able to get himself to a local hospital. The man killed the animal by suffocating it, according to Colorado Parks and Wildlife's Northeast Region. Exactly how he did so wasn't immediately clear. Colorado state park officials later found the body of the juvenile mountain lion near several possessions that the jogger asked officers to recover for him. The body of the big cat was taken to a state health lab for examination. It possibly weighed at least 80 pounds, CPW said. "In the event of a lion attack you need to do anything in your power to fight back just as this gentleman did," Mark Leslie, Colorado Parks and Wildlife Northeast Region manager, said in the statement. The park closed after the attack for an investigation, but reopened Monday evening, according to the Coloradoan. 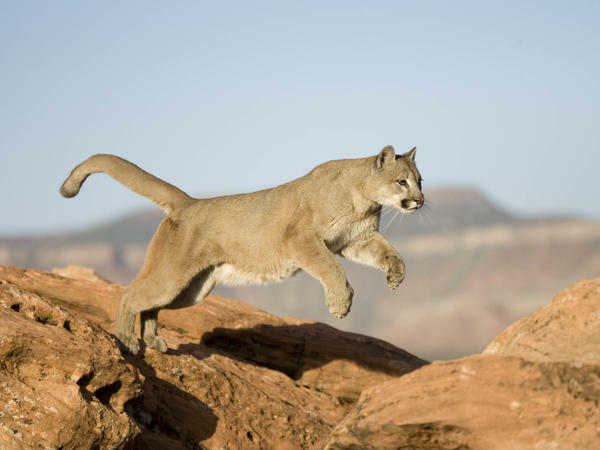 The parks service said mountain lion attacks on people are rare, with fewer than 20 fatalities in more than a century. Lions are "elusive animals" that "tend to avoid humans," CPW said. Nonetheless, if people encounter a mountain lion, they should try not to run. "Running may stimulate a lion's instinct to chase and attack," the parks service said. The parks service offered several tips for such an encounter: Face the mountain lion, stand tall, and make yourself appear larger by raising your arms and opening your jacket if you are wearing one. Never turn your back. "What you want to do is convince the lion you are not prey and that you may in fact be a danger to the lion," the parks service said. If the cat attacks, all is not lost, CPW said. "People have fought back with rocks, sticks, caps or jackets, garden tools and their bare hands successfully." If you have to fight, the parks service recommends targeting the animal's eyes and nose.